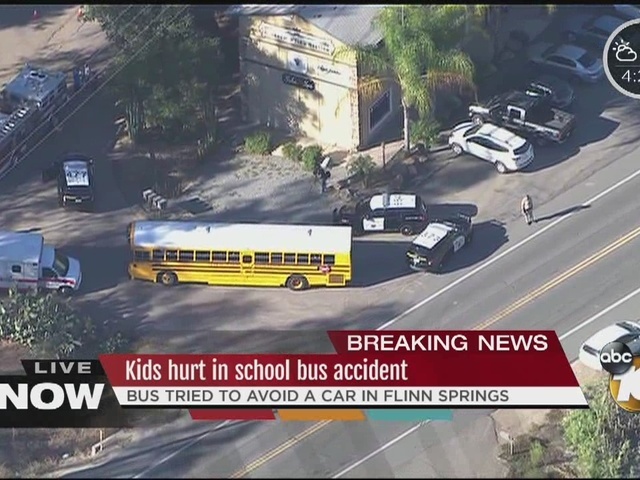 Several students complained of pain after the school bus they were riding in swerved to avoid another vehicle and made a hard stop on Olde Highway 80 in the Flinn Springs area. The incident was reported shortly after 3:30 p.m., according to the California Highway Patrol. It happened in the 14000 block of Olde Highway 80. The CHP says the bus, which had about 50 elementary school-age students on board, swerved to avoid another vehicle. The bus did not crash, but the CHP says some students told authorities they hit their head during the maneuver. 10News learned at least 10 people were taken to the hospital with minor aches and pains.